Hours after funeral PM threatens Hamas, outlining three missions central to Israel's response to the murder of the three teens. Just hours after eulogizing Eyal Yifrah (19), Naftali Frenkel (16) and Gilad Sha'ar (16) at their funeral in Modi'in on Tuesday, Prime Minister Binyamin Netanyahu gave another speech in the city, in which he elaborated Israel's course of action in responding to the murder. "We are united against terrorism firmly and strongly," said Netanyahu, who had not made any reference to the perpetrators in his public speech at the funeral, opting for a more personal and less political tone. He went on to describe three missions facing Israel currently. The first mission, which falls on the IDF and security forces, is "to reach the murderers and all those who cooperated in the abduction. All those who cooperated in the abduction and murder, their blood is on their own heads. We will not be silent and we will not ease up. We will reach them all, even if it takes time." The second mission Netanyahu outlined is a meaningful attack on Hamas's terror infrastructure in Judea and Samaria, which the IDF is already engaged in as part of Operation Brother's Keeper. "We have already arrested hundreds of Hamas activists, destroyed (Hamas-owned) houses and closed institutions, and our hand is outstretched," stated the prime minister. The final mission, he concluded, was the need to act against Hamas in its stronghold of Gaza. "Hamas continues to encourage the abductions of our citizens, and it is directly responsible for the firing of rockets into our territory, including in recent hours," said Netanyahu, referring to the mortar salvo fired during the funeral itself. "The IDF is acting in recent days against Hamas targets in Gaza, and here too our hand is outstretched." "If there is a need, we will expand the operation as much as needed," threatened Netanyahu. "If someone thinks to achieve something through terror against us - he will achieve opposite results. Hamas is responsible, Hamas will pay and continue to pay." The prime minister concluded "in front of our eyes is the highest consideration, the promise of the security of Israeli citizens." "Think from the head and not the gut"
Defense Minister Moshe Ya'alon also spoke, guaranteeing that "the Hamas organization will pay a heavy price for its acts." Despite Netanyahu's threatening words, Ya'alon said "this is the time, as always, to act with responsibility and consideration, to think from the head and not the gut, and to be patient." "The operation against Hamas isn't over, we will continue to act against it and to strike its members at all times and places," added Ya'alon. 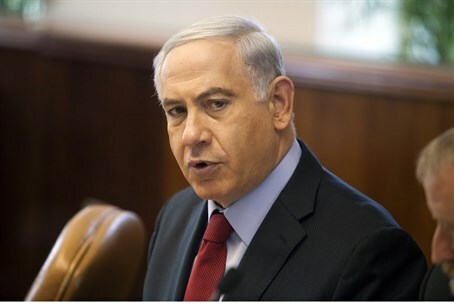 At 10 p.m. on Tuesday night a special meeting of the Security Cabinet is to be held in Tel Aviv. The question of what response Israel is to take is prime on the agenda - a topic which already raised serious debate in a similar meeting on Monday, in which leftist ministers opposed expanding Israel's operations. In that debate, Ya'alon opposed taking a large scale action, warning that such an approach could lead to war.